Note: a $5.00 charge is added to cover processing, packaging and shipping. Over the Fire Tripod Stand $14.95 usd. Integrated machined pot stand . 3" tall x 2" dia. Adjustable flame allows you to Bake and simmer. Can be used with a Imusa Mug or any flat bottom pot. burns 25 to 40 min on 1 oz. boils 2 cups in 8 to 12 min. Total weight under 2 oz. The" ARF" was developed to better regulate fuel flow. 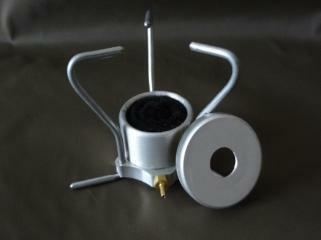 can be used with all remote feed stoves using micro fuel line. includes a 2 oz. fuel bottle. Can be used with my 4 oz. fuel bottle. sold separately.